You probably remember back in 2015 when a simple picture of a dress led to a national referendum on "What the Hell Is Wrong With You? It's Clearly Blue!!!!!" It's hard to say whether the country has truly healed the wounds from those disputes, but we're sorry to report that it's all about to start again -- and this time with sound. Redditor RolandCamry posted a clip on Sunday with the simple title, "What do you guys hear?" In it, a male voice says a word. 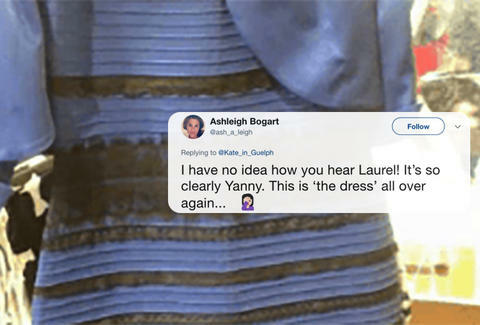 But the twist is that different people hear one of two words: Some hear "Yanny," and some hear "Laurel." And let us tell you, it's incredibly infuriating when people hear the other word. Naturally this spread through Twitter like a plague of mild annoyance, and the conflict is currently raging between the Yannys and the Laurels. As the last two tweets show, the word you hear is likely related to the frequencies you're hearing, particularly the bass. The Redditor juuular outlines the bass theory in the original thread: "If you turn the volume very low, there will be practically no bass and you will hear Yanny. Turn the volume up and play it on some speakers that have actual bass response (aka not your phone) and you will hear Laurel. "Obviously this also depends on individual physiology and on what you 'expect' to hear. I'm assuming they combined the high frequencies of 'Yanny' with the lower frequencies of 'Laurel' (with some overlap), and the two words are phonetically similar enough for this to work. However, your brain can't handle both at once, so it picks one and that is the version you hear." Granted this is some random internet person, but they make a good point. Whether you're convinced or still terrified by the apparent black magic, it's probably better that we all just forget this whole thing before we say something we regret.